The Treaty chapter on Economic and Monetary Union became after the entry into force of the Lisbon Treaty one of the most disputed chapters of the Treaties. The economic and financial crisis revealed the shortcomings of the asymmetric EMU. The present study assesses the unused potential of the existing Treaty chapter in order to improve the functioning of the EU. In order to do so, the study suggests to switch the perspective on the Treaty potential from competences to compliance. 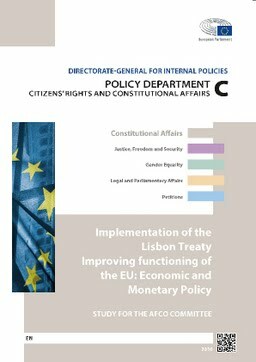 By identifying the lack of mechanisms in the existing economic policy coordination framework aiming at addressing non-compliance because of a Member State’s incapacity to comply, the study suggests the introduction of an incentive-based enforcement mechanism (for the short term) and of a fiscal capacity (for the medium term) within the existing Treaties. Furthermore, the establishment of the Eurozone budget, of a Redemption Fund or the adoption of a convergence code is discussed. By the same token, the legal inclusion of the Fiscal Compact and the ESM-Treaty is examined and concrete proposals are developed. Finally, the study addresses ways of increasing the accountability and legitimacy in EMU affairs.